The potential for a major storm hitting the South of the UK on Monday remains. The exact track and intensity are still uncertain, varying from N France to Scotland and having varying impacts on the south of the UK, from very little to a lot, depending on the final track. However, best to be forewarned! Several models show a vigorous LOW developing to the SW of the UK due to an extremely lively 180mph jetstreak or potential stingjet over the Channel. This has the effect of lifting air rapidly off the surface and lowering pressure rapidly. A rapid lowering of pressure to produce a storm is sometimes called a “bomb” and is similar to the propagation of the October 1987 storm (not a hurricane!). As it looks at the moment… the LOW will cross the UK from SW to NE and develop Force 10 SW gales in the Channel during Monday morning and, as it moves into the North Sea, stronger winds are possible up to Storm Force 11 with potential for extremely rough seas and 70-80mph winds. Inland winds will be less powerful but gusts could reach 50-60mph widely in the worst case scenario. All from the S or SW and, later on veering to the NW. Waves of 3-5metres in the Channel are possible and 10 metres in exposed waters. 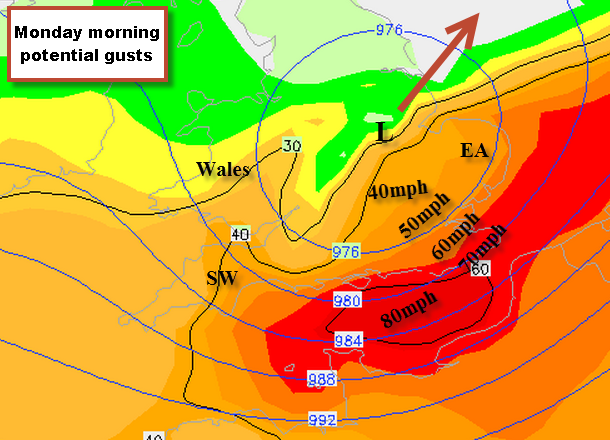 Overnight Sunday and Monday morning seem the most likely periods of highest winds for the South. The systems moves away rapidly into the north sea and winds ameliorate to sunshine and showers. Thereafter, the rest of the week continues to look unsettled with wind and rain. One to watch definitely! Watch the propagation of wave heights across the Atlantic as the mother LOW moves in during the early part of next week.